Sold in March 2018, the 31 metre motor yacht Ti Amo is back on the market, listed for sale by Costas Dimopoulos at IYC. 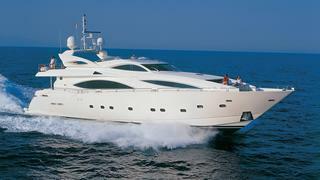 Built in GRP by UK yard Sunseeker International to RINA class, she was delivered in 2001 as a Sunseeker 105 model. Finished in warm cherry wood throughout with contrasting desert coloured carpets and cream upholstery, she accommodates eight guests in four cabins. These include a master suite on the main deck with its own minibar, a full beam VIP suite amidships on the lower deck, and port and starboard twin cabins, all with LCD television screens and en suite bathroom facilities finished in granite or marble. There are also crew quarters in the bow with two twin berth cabins and a crew mess area. The voluminous saloon is ideal for relaxation, with comfortable seating, a bar, entertainment centre and a dining area forward of the well equipped galley. However, the focal point of this yacht is her extensive flybridge, with a bar area, stools, a sink, fridge and icemaker, barbecue grill, seating and dining areas, and a Jacuzzi. More al fresco entertaining and dining is available in the aft cockpit with a seating area and a large teak table. All in all, Ti Amo boasts an extensive specification including a ride stabilising system — but not zero-speed stabilisers — trim tab controls, power-assisted hydraulic steering, MTU Blue Line Comfort engine displays and a flybridge crane for storing Jetskis. Twin MTU 16V 2000 1,800hp diesel engines give her a top speed of 25 knots. Ti Amo is asking €1,750,000.